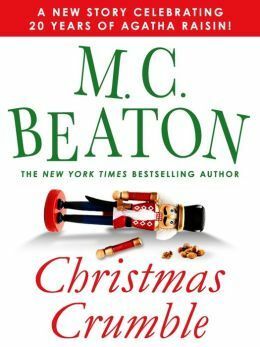 At home alone for the holidays, Agatha Raisin decides to host a dinner party for the elder residents in her Cotswold village of Winter Parva. Agatha’s never been able to cook, but she’s dead-set on making this the perfect holiday for local “crumblies". She’s decorated a tree while fending off her cats Hodge and Boswell, and even made a (lumpy) Christmas pudding in between swigs of rum. This is a novella in the Agatha Raisin series. Agatha really should know by now that her Christmas dinners are a flop! However, just as Mrs. Bloxby says, "People are apt to chase after a romantic image of Christmas which does not exist." You can't blame a girl for trying, right? Aggie actually embraces the Christmas spirit and tries to do something very kind for others, which is to host a Christmas dinner for a handful of elderly Carsely residents (whom she refers to as "crumblies") who would otherwise spend Christmas alone. Although Agatha has learned her lesson from Christmases past and doesn't plan to pass off the catering as her own cooking, she does insist on making the Christmas pudding. When one of the old men gets fresh with Agatha and grabs her bottom, she smashes the Christmas pudding over his head and he dies! Never a dull moment at one of Aggie's parties. Roy Silver is at the dinner, and Bill Wong is called in to investigate. The only ones who were missing were Charles and James. With this series, you always know what you are getting which is a fun light-hearted cozy that is sometimes a bit over the top. I enjoyed it but wished that it would have been longer. I'm nearly caught up in this series. Next up is Book #28, Agatha Raisin and the Witches' Tree. 3 stars!! It was good, and I enjoyed it!